Welcome to Ma-Fi Arts Children's Workshop, Dunedin's premier art school. Everyone has the innate capacity and desire to think and act creatively, to communicate ideas and feelings via the many and varied avenues of expression. The possibilities are enormous. 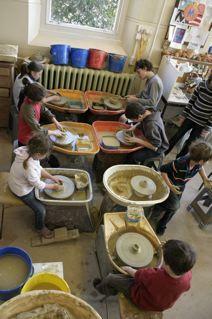 For the child to have a well-balanced education, including the practical experience of art, is essential. In modern society passive consumption is rife and boredom promotes many social and personal problems. Our programme empowers the individual and assists participants in becoming self-motivated and capable of realising their artistic vision through our expert guidance and technical skills. We run art classes for children: After School, on Saturdays, and throughout school holidays. We also run evening classes for adults. Private or small group tuition is available by appointment between 9am and 3pm daily. drawing and painting, sculpture, printmaking, mask-making, and pottery. Explore art processes via your choice of subject matter, style and media. Develop creativity and learn techniques to enable realisation of your imagination and/or representation of the world around you.